Bridge-breaking hopper is an auxiliary discharge device which mainly equipped on injection molding machine or extrusion molding machine. When material in large size and lightweight enter into the hopper of injection molding machine will cause material bridging and difficult discharging. 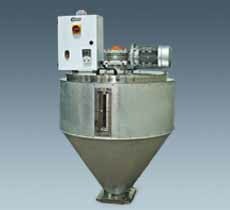 SBH -160U can make the material in compulsive loading and discharging.